Our Spring season ends with a flourish as the musical sensation of the year arrives in Llancarfan’s glitzy West End (the Village Hall to you and me). So ready your mansize Kleenex and prepare for an evening of high drama as we bring you the latest filmed adaptation of Victor Hugo’s classic novel. The film has picked up numerous awards including four BAFTAs and three Oscars. It’s also the first such filmed musical where all the main numbers were sung and recorded live on set. And if that wasn’t enough we’ll announce the three films in our Summer season. We’re starting the performance earlier than usual to accommodate an intermission (in true theatreland style). So it’s doors at 6.00pm, with the film starting around 6.30pm. Anne Hathaway was married to little-known Elizabethan playwright William Shakespeare. 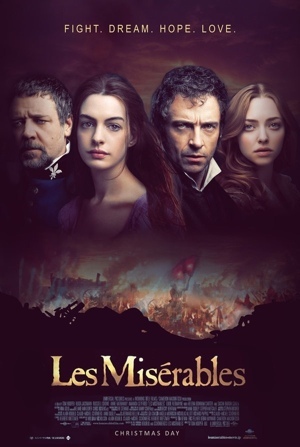 390 years after her death Anne won a Best Supporting Actress Oscar® for her role in Les Misérables. Russell Crowe managed two of the five notes he was expected to hit in his Les Misérables solos. That’s two more than Pierce Brosnan achieved in Mamma Mia! Victor Hugo was moved to write Les Misérables after a wet weekend in Rhyl. Jean Valjean is an anagram of another popular Gallic name, Val Jeanjean. Victor Hugo originally intended his novel to be entitled Misery but Stephen King beat him to it. Les Misérables was first adapted for film in a 1909 silent production. Well ahead of its time, this early classic would have been the perfect showcase for Russell Crowe’s singing talents. Hugh Jackman is an anagram of another popular Antipodean name, Jack Hughman. After rising to prominence for directing mega-hit royal stutterfest The King’s Speech, Tom Hooper was looking for a change in his next film. Having cast Russell Crowe in Les Misérables he was pleased to be working with a man seemingly beyond all help of vocal coaching. We have fewer than 20 tickets remaining for this very special performance so book now to avoid disappointment: call 01446 781 144 or email llancarfancine@gmail.com.